Just about everyone loves to sing. Out of all those people, there are many who want to improve their voice. Unfortunately, not everyone has the time or the money to take voice lessons. Voice Tutor hopes to fill this gap. We start out with a diagnostic to help you figure out what kind of trouble you're currently having with your voice. Once that's figured that out, you can take specialized lessons designed to help you overcome your own personal challenges. We've done our best to make Voice Tutor fun and easy to use, so no matter what kind of voice you have, or how long you've been singing, we can help! Voice Tutor for iPhone requires an iPhone or iPod touch running iOS 4.1 up to iOS 10. iOS11 not supported yet. Available on the App Store. I am a singer, songwriter, vocal producer and vocal coach. I love Voice Tutor! I find it to be a very useful tool for myself, as well as for my students and clients. I use Voice Tutor to do vocal warm ups before performances, before recording in the studio and simply to keep my voice in shape. I find, even with being a vocal coach myself, it's always good to have a tool like this, especially when I don't have a piano around, I can simply pick up my phone and give myself a vocal workout. This really comes in handy, especially when I'm on the road. This is also very useful and convenient for singers waiting in line for auditions, who need a quick vocal warmup. I highly recommend this product to every singer, not just professional singers, but also aspiring singers or those of you that just like to sing for fun. Worked with Justin Timberlake, Jennifer Hudson, Adam Levine, Timbaland, and many more. Voice Tutor is the go to app for professionals and beginners. It contains several vocal exercises that are the essential building blocks for vocal development. The Riff and Run section provides an easy to understand break down of today's approach to singing. 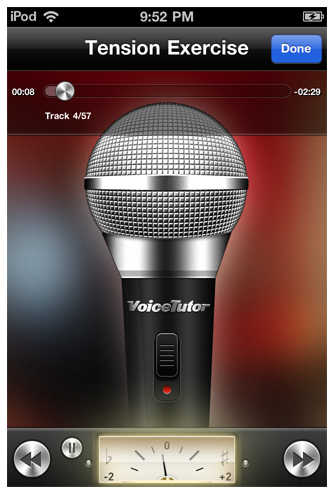 From the studio to the stage, Voice Tutor is a powerful tool for your iPhone in the palm of your hand. Musical Director for Madonna, Justin Timberlake, Janet Jackson, Jay Sean and many more. Voice Tutor is the ONLY app on my iPod. It has helped me TREMENDOUSLY. Whether you're a budding vocalist or a singing sensation, EVERYONE should use Voice Tutor. As a music manager to some of today's biggest stars, I have found Voice Tutor to be one of the best vocal coaching tools around. It's so convenient having vocal warm ups & tutorials available 24 hours a day, especially when you cannot always have a vocal coach with you on the road, all around the world. I would highly recommend this app to all singers. Music Manager for Justin Timberlake, Jay Sean and Ciara. Worked with Janet Jackson, Britney Spears, The Backstreet Boys and many others. Click play to see Voice Tutor in action. Read about our philosophy on singing. We tell you how it should feel, how it should sound and how the voice really works. Targeted lessons help you overcome any vocal challenges you may be facing, be it tension, breathiness, cracking or maintaining an already connected voice. This section is for singers who have already developed their voice and are looking to find their own unique style. If you've ever wanted to Riff 'n Run like Mariah or Christina, this section is for you! It takes you through comprehensive workouts to get you sounding like the pros! Getting ready to hit the stage, audition or perform? Need to warm up your voice? This section will take you through a complete vocal warm up so you'll be prepared for any vocal challenge! Voice Tutor is much more than simple scales. Voice Tutor has been painstakingly and meticulously crafted to be the best possible vocal companion for singers of any level. Obviously we can never replace an actual teacher, but we tried our best to do just that! Each exercise has been assembled to specifically target one of the four voice types. Everyone falls in to one of these categories and our exercises will help you overcome your own specific issues. Our goal is to help fill the world with beautiful music. The creators of this application have many decades of experience instructing singers of all levels. Whether you're just starting out, or you're Justin Timberlake, our teachers know exactly what to do to make your voice be all that it can be. If you need more personalized instruction, you can contact one of our studios directly and take lessons from our teachers. We can even do lessons over the phone or over Skype, so don't worry about location! Our studios are: Kimad Productions and IMPACK Productions. Looking for support? Feel free to contact us. User-interface, icons, and website designed by Taylor Carrigan. * Educational institutions can purchase Voice Tutor, in bulk, for a 50% discount.